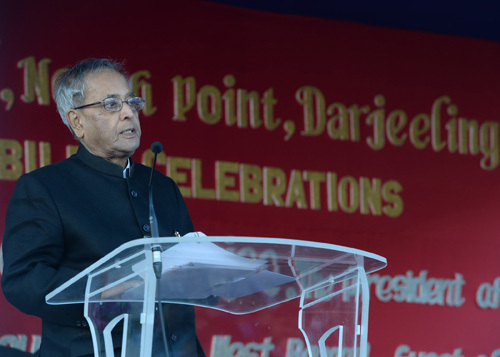 I am happy to be in Darjeeling on the occasion of the 125th year celebrations of the prestigious St. Joseph’s School. I congratulate you on attaining this momentous milestone in your history. This prestigious school has witnessed the changing fortunes of this country, its people and more intimately its students and faculty from the year 1888. Late Prime Minister Shri Jawaharlal Nehru often said, "If India is to be a great nation, it must begin in her classrooms.” Institutions like St. Joseph’s School, North Point and others run by the Jesuit fathers like St. Xavier’s, Kolkata when Gurudev Rabindranath Tagore studied, St. Xavier’s Mumbai; XLRI Jamshedpur and Loyola College, Chennai have stood the test of time and contributed to the building of our nation. I am informed that St. Xavier’s, Kolkata and St. Xavier’s Mumbai have the same founder as this school, namely Fr. Henri Depelchin, a dedicated priest of Belgian origin. Truly, he was an extraordinary man who left behind an impressive legacy thanks to his vision, leadership, tenacity and strong faith in God. There is a saying "The Battle of Waterloo was won in the playing fields of Eton”. India’s tomorrows are shaped in the crucibles of great schools, in their classrooms, games fields as well as co-curricular activities. I am glad to know this school boasts of a great dramatic tradition of operettas and music; of speech and debating; of scouting, the NCC, Mountaineering and Leadership Training Service. I also understand students undertake a Winter Camp where needy neighbourhood children are invited to the school for lessons and provided free meals, scholarships and access to all facilities. It is important that compassion and concern for the under privileged in society is inculcated in our children at an early age so that they can become change agents who transform India and lead her to a better future. It is also through such activities where children are given space in freedom, and challenged to develop their talents, skills, attitudes and values that true education happens. Education is synonymous with life itself. There is need for constant adaptation and re-inventing to be relevant to the modern times. There is need for constant efforts to upgrade our education system, at both the school and university levels. India has today enacted the Right to Education Act which is a land mark legislation that seeks to ensure that every child up to 14 years attends school. But mere attendance in school is not enough. The education imparted must be of quality and teachers well trained. The system should enable the nurturing of children who are not just good at academics but also rooted in our civilizational values and filled with energy and drive to serve society. At the time of adoption of our Constitution, we pledged to provide free and compulsory education for children. This commitment was enshrined in Article 45 of the Constitution in the Directive Principles of State Policy. This was made a fundamental right in 2002 when Article 21A was inserted in the Constitution through the 86th Constitutional Amendment Act. The Right to Education Act (RTE) which was passed by the Government of India in 2009 is thus fulfilment of a commitment that we gave to ourselves in 1950. Education is a powerful tool for social transformation. Some recent incidents of brutal assault on women and children has shaken the collective conscience of our nation. These unfortunate incidents underscore the need for us to introspect and find solutions to arrest the erosion of values in our society. Schools such as the St Joseph’s should take the lead in meeting the moral challenges of our times and reset our moral compass, ensuring that our civilizational values of love for motherland; performance of duty; compassion for all; tolerance for pluralism; respect for women and elderly; truth and honesty in life; discipline and self-restraint in conduct, and responsibility in action are fully entrenched in the young minds. Swami Vivekananda believed that education should build character. He once observed, "Education is not the amount of information that we put into the brain……… We must have life building, man making, character making and assimilation of ideas. If you have assimilated five ideas and made them your life and character, you have more education than any man who has got by heart a whole library…….”. The youth of our country are not lagging behind any other in matters of intelligence or talent; what our country needs is sincerity and dedication. It is only a broad outlook, unhampered by regionalism, unencumbered by parochialism, unhindered by prejudices that can make this nation great and ideal enough to lead the world. We must be increasingly mindful of the sensitivities of those around us and how they may be affected by our words and deeds. While we endeavour to eliminate the problems that distort our social development, and as we address imbalances, we must collectively identify the values that have over the centuries, served to safeguard the pluralistic and secular fabric of our society. And we must reinforce these ethics so that as we go forth into a globalised world, we as Indians remain faithful to these unique traditions. Similarly, we must strive to continuously generate greater tolerance and understanding among all sections of our democratic society. I urge the students in the audience to stride onto paths of life with a positive attitude and strong spirit. Besides training and education, what will keep you in good stead is strength of character, mind and purpose. I would like you to remember that knowledge should be always used in the service of the people and society. I congratulate the Provincial, Fr Rector, Members of the Jesuit Community, the teachers, the co-workers, the support staff, the students and the parents both past and present for 125 years of service to the community in Darjeeling, in India and the world at large. I am happy to learn that so many leaders across different countries and walks of life are a part of your history and identity. Many members of the Royal Families of Bhutan, Nepal and erstwhile Sikkim learned their statecraft here. 125 years spans a vast canvas of lives and events that are woven intimately into the rich tapestry of your history. I take with me memories and pictures of an institution alive to and ready for the challenges of today and the future. I take this opportunity to thank the Jesuits on behalf of the citizens of our country for blessing India with so many great institutions and organisations, for your charitable work and for enhancing the quality of the human resources that pass through your nurturing hands. I congratulate all of you once again and wish you every success.